During his annual live TV call-in show on April 18, President Vladimir Putin promised that authorities will stop pressuring the liberal Dozhd TV channel. Dozhd ("Rain") is now hoping to get picked up again by the cable providers that dropped it at the beginning of the year. But what will happen to other Russian media outlets that are sympathetic to the opposition? Over the last five months several major Russian media outlets with views ranging from moderately liberal to open opposition to the government have been threatened with closure. The first to fall was RIA Novosti, known for its relatively liberal slant. In December 2013 Putin signed a decree dismissing the former executive director Svetlana Mironyuk, who had led the agency for 10 years. A similar thing happened with two other independent media outlets – the Ekho Moskvy (“Echo of Moscow”) radio station (which, incidentally, is a subsidiary of the state-controlled company Gazprom-Media Holding) and Russia's largest news portal Lenta.ru - both of which had clearly anti-Kremlin editorial policies. In February 2014 the management of Gazprom-Media, which owns Echo of Moscow, also decided to dismiss executive director Yury Fedutinov. In March 2014, Russian businessman Alexander Mamut, co-owner of the media giant Rambler&Co, which includes Lenta.ru, sacked the chief editor of the site Galina Timchenko. After the Timchenko’s ousting, most of the editorial staff chose to leave in solidarity with Timchenko and to protest the pressure that Mamut put on them. 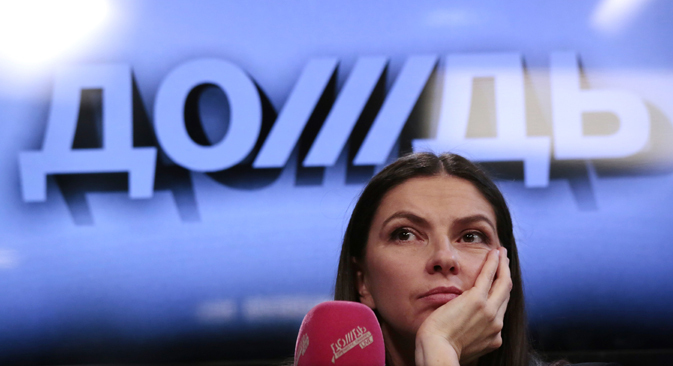 Earlier, at the end of January 2014, Dozhd TV station was sharply criticized by officials, journalists and ordinary viewers because of a controversial question it posed about the Siege of Leningrad. The discussion that caused all the uproar in one of its programs asked whether Leningrad should have been surrendered to the Germans in order to save hundreds of thousands of lives. Prosecutors and Russian mass media regulators Roskomnadzor began to investigate the channel. After that, all the leading cable providers in Russia dropped Dozhd from their broadcast packages. However, the executive director of Dozhd, Natalya Sindeyeva, who owns a 95 percent stake in the station, decided to continue broadcasting, and then - unexpectedly for the entire media community - the station received the green light from Putin. Pressure on the media by the authorities and shareholders has once again created a buzz in the media and on social networks about the decline of the free press in Russia. Meanwhile, a fair number of independent media companies remain in business, though their editors don't see much reason for optimism as they look to the future. In late March, the pro-Kremlin website Politonline.ru compiled a list of 20 media outlets that are threatened with closure because of their "anti-Russian" stances. Most of the companies on this list have not yet been hit with any sanctions. The Politonline.ru list ranks the media according to the number of times they use negative keywords (such as "annexation" and "Anschluss" with respect to the Crimean episode) and in this way determine which publications support the opposition. As a result, the list includes mass media that clearly side with the opposition (like Novaya Gazeta and The New Times magazine), and mass media that don't position themselves as the opposition (for example, sites Snob.ru and Slon.ru). Representatives from publications on the Politonline list are talking cautiously about the future. "It's not possible that everyone is feeling the pressure but us, it is suspicious and even a bit awkward," says Nadezhda Prusenkova, a spokesperson from Novaya Gazeta. "I don't think that something bad will happen to Snob.ru, but really... anything can happen," admitted the website's chief editor Nikolai Uskov. Self-censorship could guarantee their security, which Uskov admits is necessary, albeit with the caveat that it is primarily the emotions of the writers that should be kept in check - no one will be forbidden to express any opinion. He calls for publications to remain balanced and increase the share of non-political content in the mass media. In size, the liberal media, which is mainly concentrated on the internet, can hardly compete with the state. According to a poll conducted by the All-Russian Center for Researching the Mass Media in 2013, the main source of information for Russians remains TV. About 60 percent of people get their news from TV channels, most of which are controlled by state agencies. Only 23 percent of Russians quench their thirst for information online. "These are cosmopolitan Russians... and the humanitarian-minded intelligentsia," says media analyst Ivan Zasursky, a professor at Moscow State University School of Journalism, when describing the readership of independent Russian media. According to him, these several million people travel frequently, making them a significant factor in the political life of the country. Those who read media that support the opposition in Russia in any case are not going away, no matter how serious their problems are, and will most likely find a replacement if their usual sources are censored or disappear, say analysts from the media industry. "This is a temporary defeat that will soon be won back," says Zasursky. "The needs of niche groups will remain, and they must be met," agrees Uskov.